In these days with limited access to mental health facilities, and when in-patient or out patient treatment might be focused on invasive treatments and not on recovery, you may be tempted to “provide sanctuary” for a friend or family member who is experiencing serious mental health challenges. Many of you have probably already done this. I have been interested in “sanctuary” ever since I heard of the work of John Weir Perry at Diabasis House back in the 1970’s. Perry believed that people who were having mental health difficulties could heal themselves if they were allowed to talk about and act on their feelings in a safe place where they were supported by caring individuals. His research on this project showed astounding results. He found that even people who were most seriously affected would, if given the opportunity, heal themselves in about 40 days with often no recurrence of the mental health difficulties over time. In this sanctuary, people could do whatever they felt they needed to do to relieve their distress. People did things like yelling, singing, ranting, raving, drawing, painting, and making music. Supporters listened and listened and listened without judging or interpreting what they were hearing, and without interrupting with stories of their own or advice. The program was remarkably successful. Perhaps that is why it was not widely replicated until recently when I have heard more and more discussion of creation of these facilities–especially since the publication of “The Anatomy of an Epidemic” which challenges the safety and efficacy of psychiatric medications. I recently toured a new facility, Hilltop Recovery Residence, that is near my home in Vermont, a facility that is replicating Diabasis House. This is so exciting. This new program is being carefully studied. I hope that sanctuary with good supports will soon be available to anyone who is dealing with mental health issues and who wants to recover. Recently my spouse and I have been providing sanctuary for a young man who is experiencing Post Traumatic Stress Disorder including hallucinations, flashbacks, dissociation, intrusive thoughts and nightmares that were so serious that he could no longer live with his family. I have found that there is little guidance for anyone who is taking on such a project. I thought it might be helpful if I shared some of the things I have learned in the three months that he has been sharing our home. Everyone in the household must be willing to provide sanctuary and be part of the “therapeutic milieu” that is created. Taking another person into your home when they are having mental health challenges changes the dynamics of your family. This may be more stress than your family or you can handle. Your family may already have acute stress. There may be issues that have to do with things like illness, relationships or employment. If these issues are sometimes overwhelming too your current family, don’t try to take on and help another person. It won’t help anyone. And could make it worse for everyone, including the person you are providing sanctuary for. Develop a Family WRAP® (Copeland, M. 2013 Dummerston, VT. Peach Press). If possible include the person who is receiving sanctuary in the Family WRAP® process. The person who needs sanctuary must have a separate bedroom. A couch in the living room or family room, or a room that is shared with others is not sufficient and will cause more stress for everyone. People who have mental health difficulties often have sleep issues–an inability to sleep or sleeping a lot. They may need to have a light on at night, be journaling, using a computer, be pacing or making unusual noises. It is important that these issues not affect the sleep of other members of the family. If possible, the bedroom for the person who is having mental health difficulties needs to be out of the general stream of household traffic. It may get very messy. And it may be hard for the person to keep it neat at this time. In my situation, I got permission from the person who is staying with us to “tidy up” his space when he was at an appointment. When I did that I was careful to be respectful of the things that are important to him. But I could easily gather up dirty clothes for the laundry, change the sheets on the bed, toss out used tissues and scrap paper, dust and vacuum. That helped a lot. Everyone in the household needs to agree to accept unusual behaviors like the person talking to themselves or yelling at someone who isn’t there, loud playing on a musical instrument, not having regular sleep and wake schedules, hollering, ranting, raving, pacing, foul language. The limits or boundaries of acceptable behavior can be determined in a family meeting with everyone present–and the limits must be acceptable to, and adhered to by everyone who lives in the home, including the person who is receiving sanctuary. Be absolutely clear about behaviors that are not acceptable and the consequences. For instance, you might say shaming, blaming, teasing, bullying and threatening anyone is unacceptable. If these things happen we will talk about it once. If it happens again, you will have to find a different place to stay. Limits or boundaries may need to be set up around clean up, tidiness, times when noise is acceptable and not acceptable, phone and television usage, friends stopping by and leaving lights on or having them off. Listen, listen, listen as much as you can. The person’s sharing doesn’t have to be rational or make sense. The talking itself is healing. Have clear boundaries around your ability to listen. You can say something like I have 10 minutes when I have to listen and then I have to go. Or you can say, “I can listen to most things, but when you talk about how your friend was hurt, it is too hard for me to hear”. If possible, have opportunities for the person to express him or her self in whatever way they choose–drawing, painting, making music, exercising, hitting a pillow, etc. Get help. In our case, other families agreed that he could stay with them part-time, sometimes for several days. That helped a lot. At other times, a friend would take him out to an event or for a meal. (I had to instruct that friend that I needed him to take our person away for a period of time as I needed a break. Otherwise they would stay in our small house, talking, perhaps cooking, and it wouldn’t be a break for me.) Friends have helped with shopping, meals and getting him to appointments. Our biggest need has been respite. I was realizing that staff in hospitals work 8 hour shifts and we were working practically around the clock. That gave me some perspective. Ask for help and be ready to tell people what to do that would be helpful. Do good things for yourself, with your partner and with other family members. Follow your personal WRAP®, your couple’s WRAP® and your family WRAP®. Take time to do whatever it is you love to do by yourself and with the people that you love. Don’t neglect or negate yourself or your family in this process. As soon as possible, and the person who is receiving sanctuary is willing, begin working with the person to develop a personal WRAP, or tell them how they can develop their own WRAP®. In our case, we have begun the process very slowly by identifying many, many Wellness Tools. You might encourage the person to attend a WRAP® group or a WRAP support group. Perhaps they could find a WRAP buddy. Or you could connect them with a Community Links Project (Copeland, M. and Mead, S. 2007. 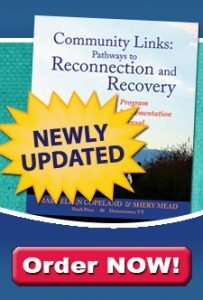 Community Links: Pathways to Reconnection and Recovery. Dummerston, VT: Peach Press). The person should have other supports in addition to you and your family. Take advantage of any appropriate services that are available in your community. Case managers, counselors, health care providers and advocates can all help. “Sanctuary” should be a temporary arrangement. Work with the person or have other supporters work with the person to help them make plans and begin their transition to a life on their own or with their family. If you decide to provide sanctuary, it is a huge commitment and a great gift to humanity. Thank you so much. And please do let us know how it is working for you and any lessons you learned along the way that might be helpful to others. As we learn more and more about this option from people who are trying it, we can make it easier and more helpful for everyone involved. There are lots of materials in our bookstore that may be helpful to you in this process.